I’d like to apologize for neglecting this space. The piece that I was supposed to post last week ended up not feeling right, so I’m going to instead leap to a feature that I planned for this site, the random useful tip. Random useful tips will be little things that I’ve noticed help smooth the wrinkles of my day. Or in this case, preserve the integrity of my skin. 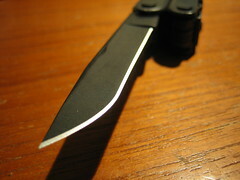 Here’s my tip for folding knives: When you close a folding knife, hold the blade and close the handle. I know, it sound stupid and trivial, but it actually feels radically different, and a lot more controlled and safer as a result. It’s an interface design trick. The basic aspects of the design (affordances) are that the knife is small, and the body/handle is big. So the knife is the moving bit of the handle. It’s simple, natural logic. And as a result, the natural thing is to hold the body and close the blade. Except think about this: What it means is that we have to grip the handle, usually a little oddly to both hit the blade release and also to allow the blade to close without passing through a finger. And we have to grip the blade, but that grip usually has to allow for the fact that the blade is pivoting around the joint of the knife. Whereas… if you hold the blade still and move the handle, you’ve got a firm grip on the sharp part, and the only thing that can happen if you lose your grip on the pivoting handle is that it might snap closed, or fall open, neither action doing harm. As I acknowledged, it sounds dumb, and even trying to explain the difference sounds pretty flimsy. But if you have a pocket-knife, try what you usually do. And then try closing the handle to the blade, if you don’t already. And let me know if you feel the difference, or if you think I’m crazy. Before my first camping trip, I went with a friend to one of those outdoor stores because that’s what I figured people do when they’re going camping. Most of my purchases were very rational, a ground sheet, a waterproof cover for my sleeping bag, a compass. And then I arrived at the display case full of pocket-knives. I have wanted a swiss army knife since my childhood. I had a little red pocket knife, but it had only one blade. No screwdriver, no file. And no swiss army logo to at least console me with it’s authenticity. So there, then, was arrayed before me the objects of childhood desire, in glass encased. And not just swiss army knives, oh no, but beautiful and fancy knives of many different brands, with many paramour tools nestled close. Screwdrivers, magnifying loupes and lanyard hooks, oh my. I don’t remember what I’d started to rationalize, but I have to believe that it was one of the red-shouldered Victorinox brethren, when my friend interrupted me and said I didn’t want a pocket knife. Considering that right at that moment I was entirely certain that I *did* want a pocket-knife, I briefly considered accepting his comments as fighting words. (Till I considered the resulting display of the martial prowess of two scrawny engineering students and the laughter that would inevitably be its soundtrack). And that’s how I got my Leatherman™ Multi-Tool. Sadly, the leatherman was just never quite designed for the sort of abuse an unthinking engineer could inflict in the course of his day-to-day mayhem, and the thing has suffered, with nicks in the blade and in the wire-cutters. Still, I have a great affection for my multitool and it only stopped travelling with me when airport security got a lot less friendly to brown people with knives. Somewhere around 2003, my manager got a bunch of swag from a tradeshow and rewarded us on his team by sharing. I don’t know how it was unclaimed before it got to me, but I grabbed the Leatherman™ Super-Tool as soon as I decently could. The Super-Tool is a much larger version of the Leatherman I originally got. And I think it’s a higher quality piece. I can certainly assure you that the blades on it are nice and sharp, because as I was closing it one day, the spring-tensioned knife edge snapped out of my grip, flipping the entire knife out of my hands for a moment into a spin that ended with the knife clamped on my knuckle. It’s an interesting scar. And it’s what made me think about a better way to to things. Tagged with design, history, interface, knives, life, misc, random, risk management, safety, tips, tools.